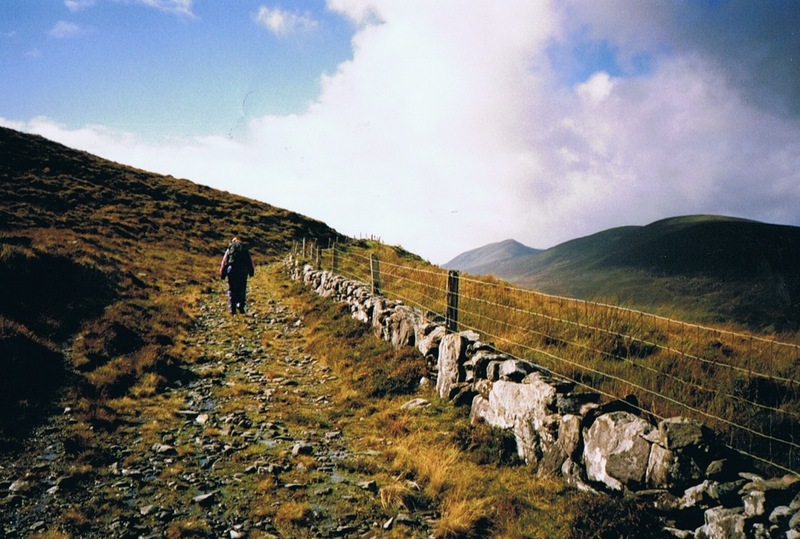 The Kerry-way is a well signposted walking trail, about 215 kilometers, looping around the Iveragh peninsula in the south-west of Ireland. 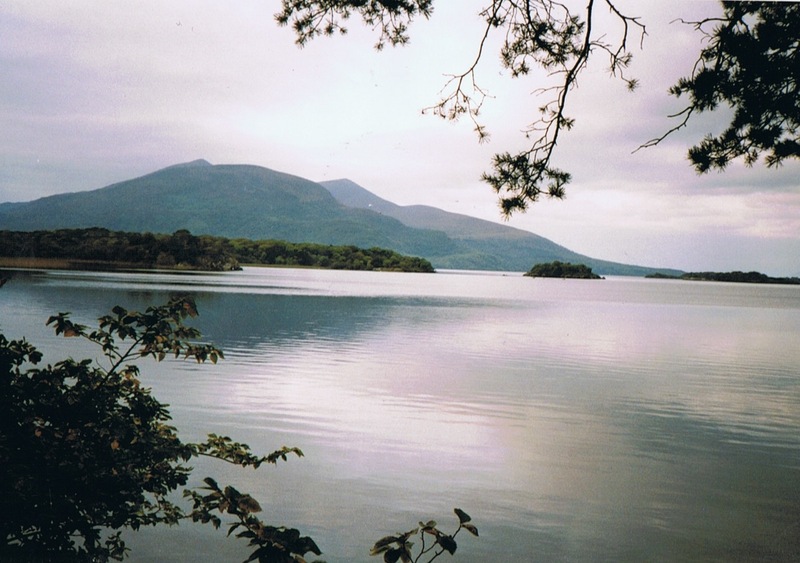 The trail offers great views on the Mac Gillycuddy’s Reeks, the highest mountains of the country and the backbone of the peninsula. 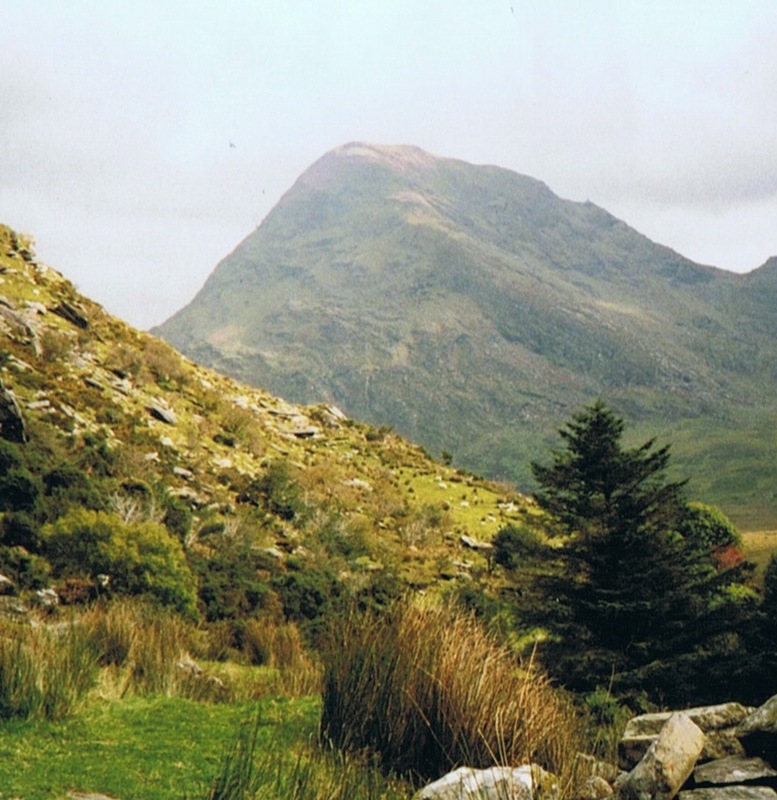 You never walk, nevertheless, above about 400 meters: the Kerry-way avoids the higher peaks. 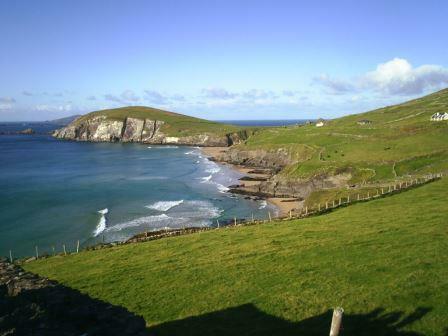 Walking further to the west the route offers you great panorama’s of the Dingle-bay and the Dingle peninsula. In the far west you can admire the Atlantic Ocean. 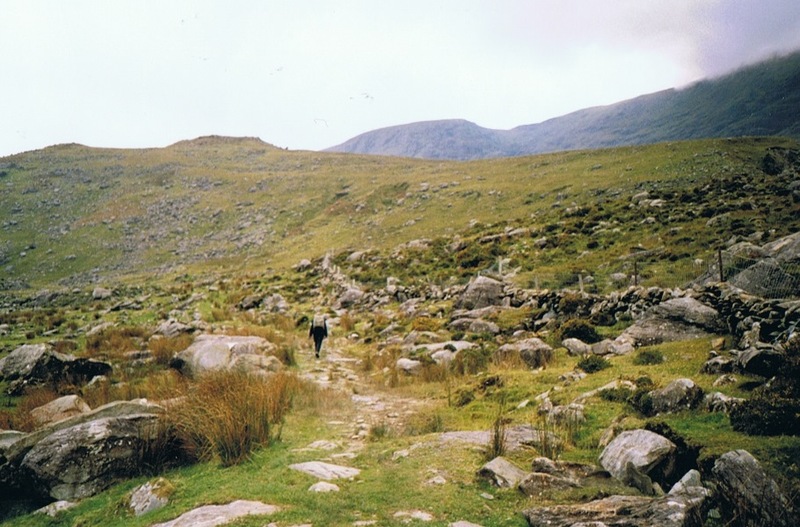 The route goes through “old paths”, green roads or "boreens", little roads, no roads, or rough boggy terrain. Especially near the villages and little towns the “old paths” are changed into “asphalt roads”. 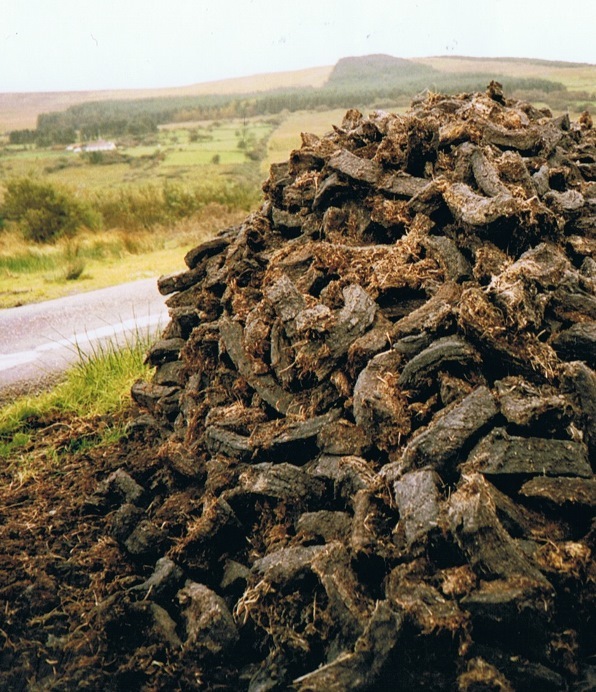 Ireland is , economically, booming ( ….2005…).With all the “symbols“, like iron fences, second homes, “private property”, “beware of the dog”, deviations and claiming the farmer for accidents. Or extensive texts that the landowner can't be held responsible for "the loss of your cell phone" or something like that. 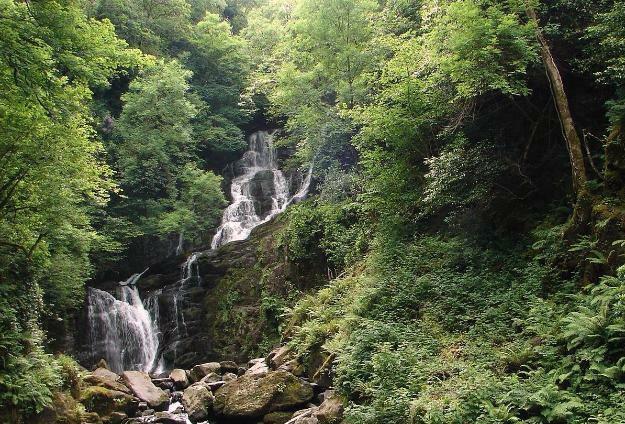 Nevertheless, the Kerry way is a fantastic trail!! The maps: Ordnance Survey of Ireland , numbers 83 and 78. Getting there: a flight to Cork, the direct bus to Killarney (1,5 hours) where we started. You also can start in Kenmare. Accommodation: B&B’s, guesthouses. Plenty. The great B&B-system mostly arranges your place to sleep and eat for the next day. Including a warm meal. October 2005: five stages of the Kerry-way. And, next day, by bus from Waterville to Killarney (2 hrs). From Killarney the direct bus to Cork airport. 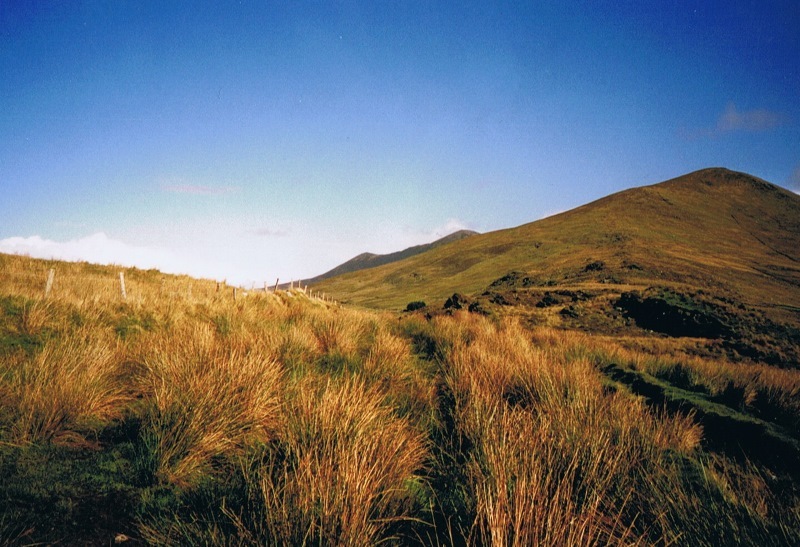 (385 m) near Glenbeigh and the view at Dingle-bay while walking the uplands near Drung Hill. And, at the end, on the peat fields, the Atlantic Ocean! It’s almost too much in such a short time.……..
Alternately through mountains and valleys, along lakes and bays. Through old forests and wild bogs. Remote mountain moorland. From the cliffs, and sandy beaches you can enjoy beautiful views over the many rocky islands. Numerous archaeological remains which give the route a strong historical character. The stage between the Black Valley and Lough Acoose, day 2, is one of the most scenic one on the Kerry Way. 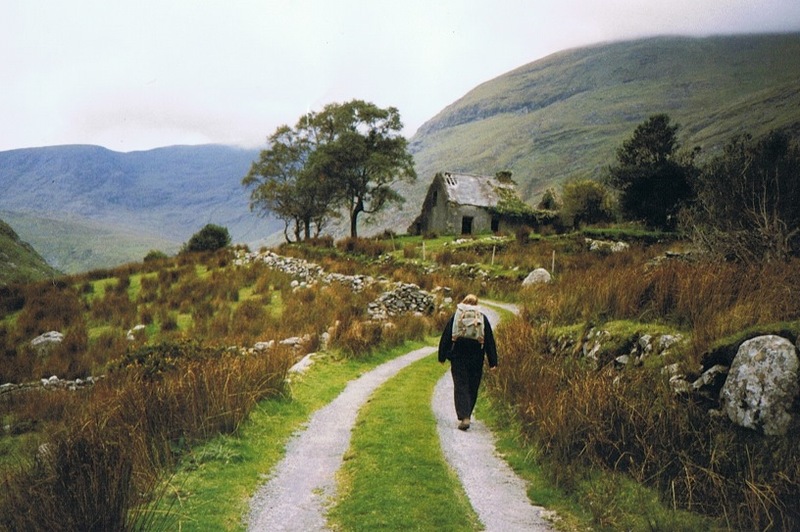 If you know a video about the Kerry way without the selfie-maker(s) on it, please give me a mail.